Fresh, good quality seafood is hard to come by in Phoenix; I mean let's face it we live in a desert. But in all honesty there are a few stores out there that are doing it well. Most recently I checked-out Chula Seafood in south Scottsdale and was quite impressed with the selection, quality and prices. I purchased a few pieces of black sea bass from Chula and made a delicious Mediterranean inspired meal for my husband and I. The sea bass is roasted in the oven with red onions and fresh sprigs of oregano. 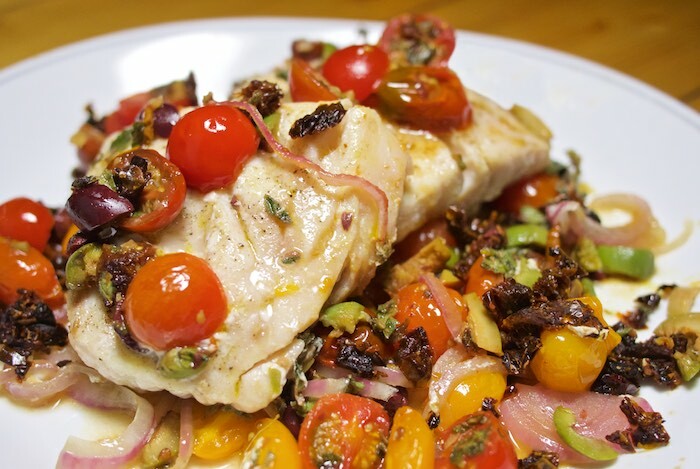 During the last 6 minutes of cooking the fish is topped with a healthy mix of tomatoes & olives. It's an elegant easy-to-make dish that is loaded with flavor. Mash garlic to a paste with 1/2 teaspoon salt. Transfer to a bowl and whisk with oil, chopped anchovy, vinegar, and some crushed red pepper flakes. Toss with remaining salsa ingredients. Let stand, stirring occasionally, while cooking fish. Preheat oven to 425°F with rack in middle. Oil a small baking pan. Rub all sides of fish with oil and season with salt and pepper. Place onion slices and oregano sprigs down first. Place fish on top. Roast fish about 10 minutes. At this point remove fish from oven and top with salsa. Place back in oven and continue cooking another 5-6 minutes until fish has reached an internal temperature of 135-140. The freshness can't be beat! Looks delish! I love quick and easy dishes like this and so elegant! I'm with Raia! LOVE fresh salsa atop the sea bass. The salsa includes many of our favourite flavours. Thanks for another great recipe. Do you use a thermometer to check the internal temp of the fish? I love this type of salsa with fish. So good! This looks like a delicious dinner idea. Wow this sea bass looks amazing!! That salsa gives it the perfect touch! I love sea bass. The salsa on the top takes it to a whole other level. I could never live inland, the lack of fresh seafood would be awful, lol! How do they transport it to the desert? Still, this recipe sounds amazing!